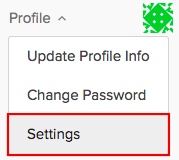 If you make a submission that requires payment, your credit card information will be saved in your profile, and you can find it by clicking on Profile > Settings. Anytime you make a submission that requires payment, this information will automatically populate in the credit card information box for your convenience. How can I delete my saved credit card information? If at anytime you wish to delete your saved credit card from your account, simply click on the trash can icon to the right of the credit card in your profile Settings. The next time you make a payment, your new credit card information will again be saved in your account.